I have played squash for around 50 years but I have NEVER played squash doubles – up to now, at least. This is sure to change soon. Why have I never played? – well, I always considered squash doubles to be a dangerous game. I thought it was too easy to get hit by a wayward racket swing, or to suffer a fast ball to the middle of the back (or worse!). So for this reason, I never really considered trying squash doubles. In hindsight, this is a shame. 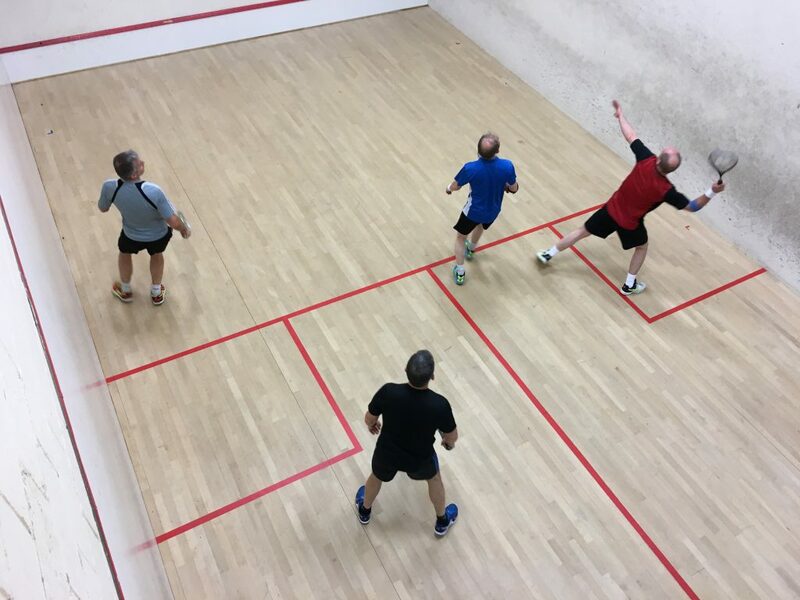 There’s not a lot of room on a normal-sized squash court when playing squash doubles! So – what’s made me change my mind? Well, recently I got the chance to watch a squash doubles tournament being played. My son was participating, and so I had to go and watch, of course, and ‘cheer him on’. I was fascinated to see first hand how the game was played and also, according to my previous idea about the game, to see how many would be carried off injured! It was a truly enjoyable time – and I am glad to say that there were no injures whatsoever – despite there being a total of 8 doubles teams, playing in a round-robin style tournament (each team played everyone else) – so 28 matches played in total. This led me to my first realisation about the squash doubles game – when played correctly, it’s hardly any more dangerous than the singles game. 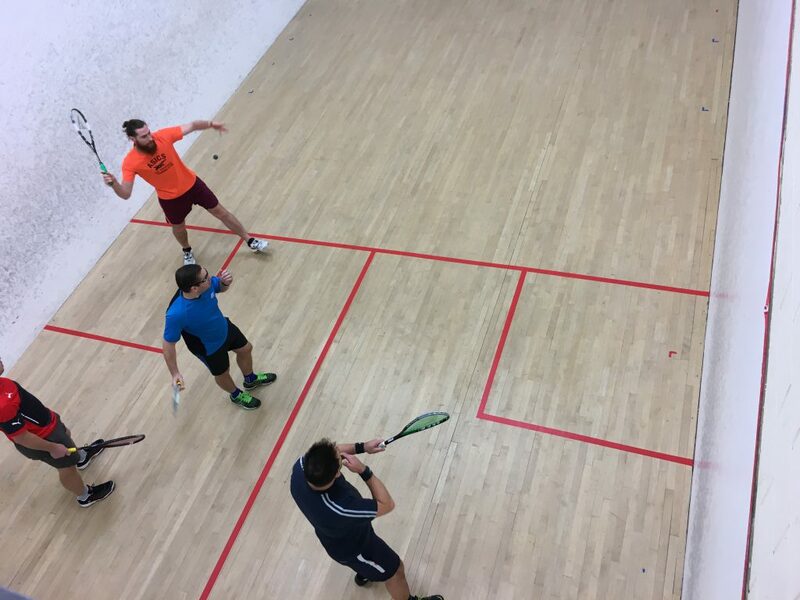 Since I had never played squash doubles myself, and knew little about how the rules for doubles differed from the singles game, I was at first a little confused as I watched the play. I couldn’t easily determine who was playing with whom. I couldn’t understand how the four players on court knew who would hit the ball next – and even less how they kept out of the way. As I watched, it started to make sense. I pestered the organisers and anyone else who would listen, really, with questions about the rules, tactics, etc. Gradually I picked up the rudiments of the rules and the basic ways in which the game was kept safe for all four players. Since that day, I have done a fair amount of reading on the subject, and can see that just like the singles game, the rules are open to interpretation somewhat, and in order to be enjoyable, the players must agree on their interpretation of the rules. The tournament I watched did not award strokes – but quite a few lets were requested and generally granted. Obviously with four people on the court, it’s difficult to avoid being in the ‘line of fire’ to the front wall all of the time. However, the players seemed quite happy to play through this sort of interference, provided their shot was safe, and only stopped for lets when they were in danger of hitting someone with their racket, or of hitting another player with the ball through a lack of choice of shots. This brings me to the first unwritten rule of squash doubles – only play with players who you trust to play safely. I’m sure it’s no fun to be on court with someone who will go for each and every shot, ignoring where the other players are. This is true of singles, of course, and I’m sure many of you reading this will have been on court with ‘that player’ – the one who swings wildly and smashes the ball to the front wall, missing you by mere inches! However, with singles, you have more space to get out of the way – it soon becomes crowded on court when playing squash doubles. The second realisation I had while watching the tournament was that the squash doubles game is so much more fun than the singles game! I think this is generally true of most other racket sports, having played both tennis and badminton. The doubles version tends to be a little less serious and a bit more fun – or in this case, a lot more fun. Don’t get me wrong – the tournament players were playing to win, but there was quite a lot of laughter around too. So one of my New Year’s resolutions (perhaps the only one I will definitely keep!) is to organise some doubles games at my local club. I have asked around a little, and as far as I can tell, none of the members have played squash doubles before – I intend to change this. I imagine many of the players have a similar view of the game as I did before I got ‘up close and personal’ to the game. I would be more than interested to read comments from anyone who has played squash doubles – and also comments from players who haven’t (why not?). N.B. Thanks to Bluecoat Sports , in Christ’s Hospital, Horsham, West Sussex, UK for allowing me to watch and take a few pictures during the tournament!